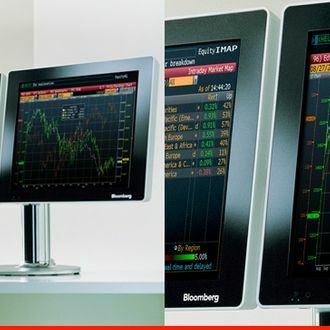 The magical, $20,000-a-year financial services machines known as Bloomberg LP terminals are everywhere on Wall Street, for better or worse. Along with the constant stream of market information, the terminals apparently provided a window into the workings of their users for Bloomberg’s 1,000-plus army of journalists, according to allegations from Goldman Sachs and JP Morgan. The New York Post reported, “a Bloomberg reporter asked a Goldman executive if a partner at the bank had recently left the firm — noting casually that he hadn’t logged into his Bloomberg terminal in some time … Goldman later learned that Bloomberg staffers could determine not only which of its employees had logged into Bloomberg’s proprietary terminals but how many times they had used particular functions.” In other words, the companies were paying for the pleasure of being watched. Several former Bloomberg employees say colleagues would look upchat transcripts of famous customers, like Alan Greenspan, for amusement on slow workdays. The transcripts were typically mundane and hardly incriminating, but who wouldn’t enjoy watching a former US Federal Reserve chairman struggle to use a computer? For now, the fun is over, but the fallout may not be.